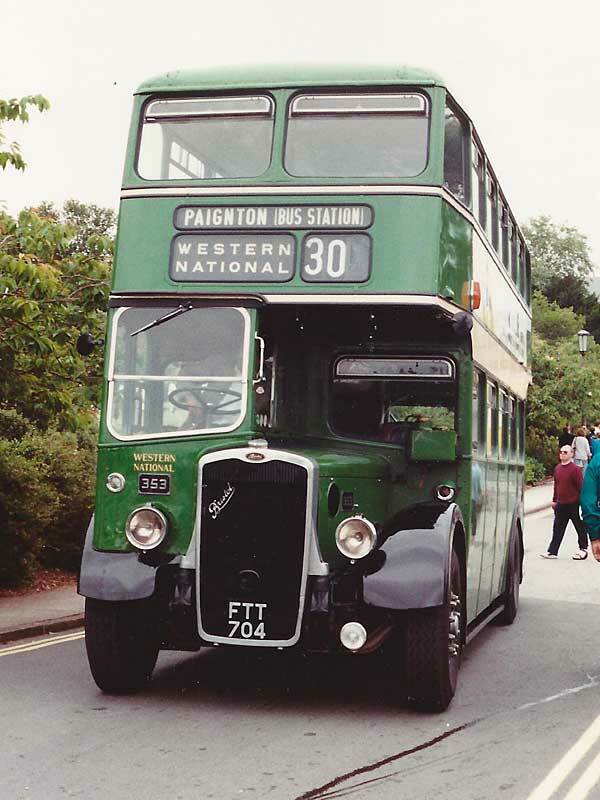 A few weeks ago Torbay was once again treated to the sights and sounds of heritage buses as they provided free trips around the area as part of the Torbay Vintage Bus Running Day. Sadly I was not able to go along this year but the photographs shown here are from a previous event, held in the attractive surroundings of Oldway Mansion, Paignton in 2001. 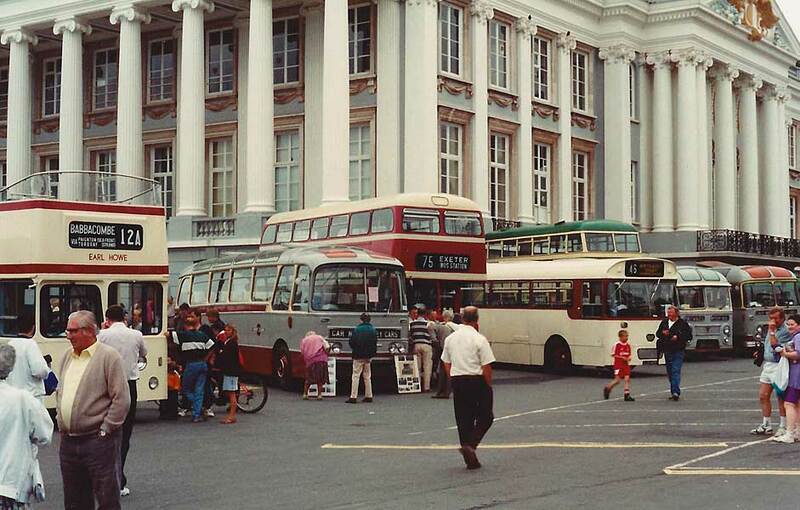 For several years the rally was organised at this location by the Devon General Society and it brought together an impressive number of local buses. Devon General, Grey Cars, Exeter Corporation and Western National were all represented. I wasn’t actively involved in the world of heritage buses at that time but just went along with my family. I couldn’t miss the opportunity, as it was right on my doorstep! Seen on the far left of the picture is 932GTA, one of the famous Devon General ‘Sea Dogs’. This Leyland Atlantean is now owned by Bob Follwell and visited Torbay in early May this year along with 3 others for a special running day. FTT704 was one of several buses offering free rides. I can’t remember if we rode on it or not but we probably did, owing to my fondness for the products of a certain factory in Brislington! This is a Bristol K6A, the ‘A’ unusually denoting that it was fitted with (and presumably still runs with) an AEC engine as opposed to the more usual 5 or 6 cylinder Gardner unit. It is currently in the care of the Bristol Vintage Bus Group and regularly attends rallies and running days in the Westcountry. Yesterday dawned slowly. In other words, it was barely getting light at 7am when normally it would be bright enough to set the senses jingling at the prospect of a new day. It hadn’t improved much by the time I left home for what may possibly be my last conducting turn on the Service 400 ‘Exmoor Explorer’. Arriving at the Bishops Lydeard garage of Quantock Motor Services I was rather alarmed to see Bristol LDL6G VDV752 already out on the road and ready to go. Even more worryingly, there was already a conductor inside! However, it turned out a ‘clerical error’ had been made in the office and the aforementioned conductor left soon afterwards. Home to bed again, I was told. 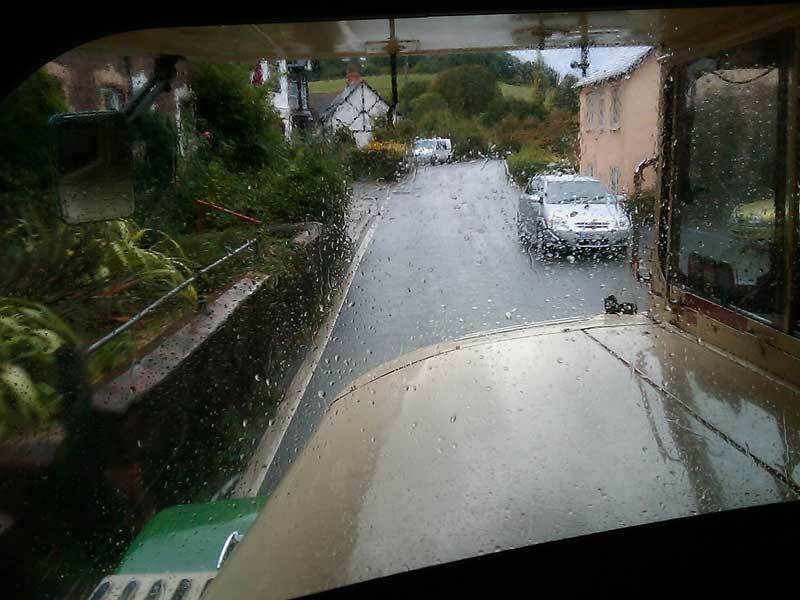 We proceeded up to Porlock for breakfast, about an hour’s drive with an empty bus, through several showers of rain. On the way we passed through the appropriately named village of Washford (above). Today, I decided, it should be re-named ‘Awash-ford’. Arriving at Porlock’s Doverhay car park, I decided to delay wiping down the upper deck seats until AFTER we’d had breakfast at the Lorna Doone Hotel. I needn’t have worried. There weren’t any passengers to occupy them. 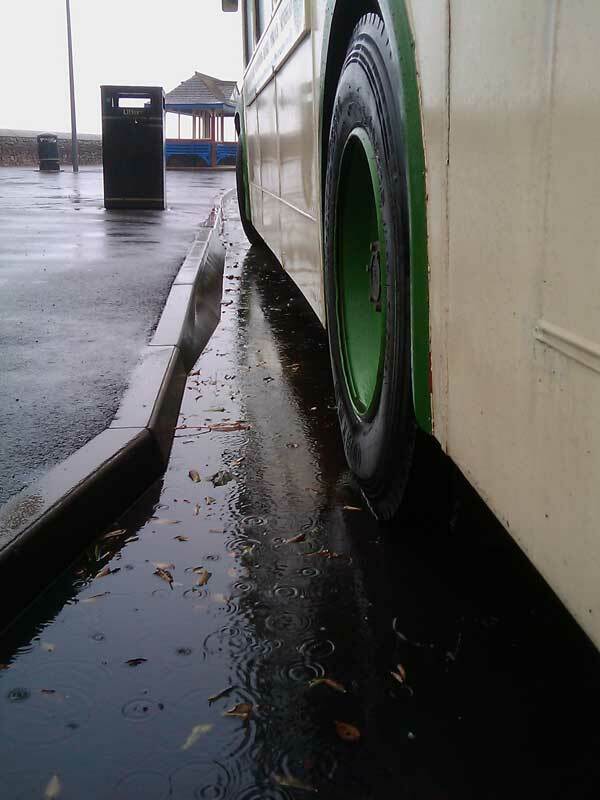 We departed, still empty, for Minehead and parked at the seafront stop in a huge puddle of rainwater. Service 400 – last one ever? 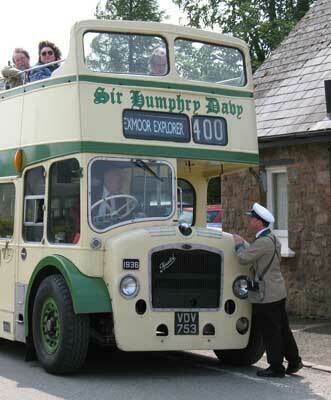 This Sunday’s conducting duty on the Service 400 ‘Exmoor Explorer’ could be my last one ever. Prospects of a further season as a commercial enterprise continue to look bleak, unless I can persuade Mr QMS to take a chance with the revival plans mentioned in my last post! I will of course write next week about how it went. One of the ex-Western National Bristol LDL open top buses is also due to run on Sunday September 25th, the final run of the season. The pair of LDLs have been a popular and familiar sight as they have plodded around the tortuous Exmoor route for the best part of 10 years. So what can be done to revive the fortunes of service 400, the ‘Exmoor Explorer’? 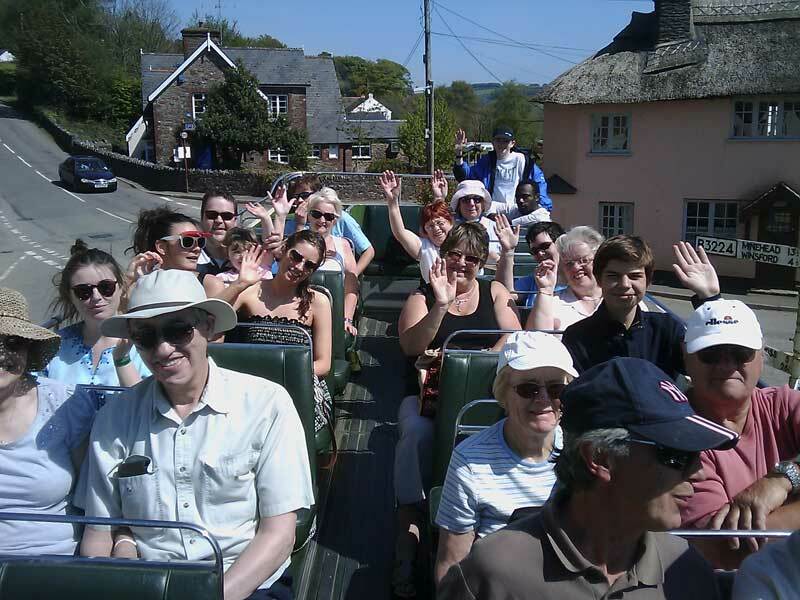 I’ve been conducting on the service 400 open top tour for about half of its existence and in that time I’ve seen a slow decline in passenger numbers. I don’t know its early history but I believe it started as a minibus service, running one round trip per operating day. At the peak of its popularity there were three departures per day, using 2 open top Bristol Lodekka buses but this proved too costly to sustain and a two-trip format has been in place for the past 7 years. In all that time, the service was supported financially by Somerset County Council (SCC) to the extent that Quantock Motor Services, as the contracted operator, was being paid a set amount to provide the service. This being the case, SCC took responsibility for promoting the service. The Council designed and printed attractive timetable leaflets which were distributed around the Minehead area and carried on board the buses to cater for passing enquirers. Timetables were also posted on all the bus stops around the route and a dedicated page was maintained on the SCC website. There may also have been other forms of marketing that I’m not aware of. Now that SCC has withdrawn funding from the route, their only contribution is to print a limited number of leaflets and maintain the Service 400 web page. The service now has to support itself as a commercial venture and depends on good loadings to generate sufficient revenue. Unfortunately there isn’t a great deal of expertise within the company when it comes to marketing and promotion. The QMS website hasn’t even been updated since May and I get the impression that there isn’t the will to make the 400 successful again.